For the past decade Geodex has focused on what can be termed the critical metal suite. These include tungsten, tin, antimony and indium as well as copper and molybdenum. In a December 2, 2013 blog posting we provided some background on tin and its uses. 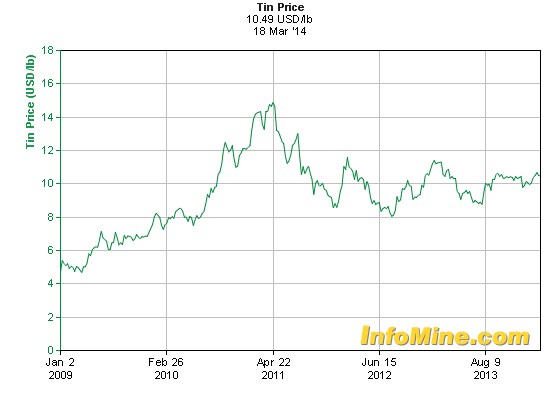 Tin has been in the news over the past months, at least among commodity traders. The main reason for this is that Indonesia, the world’s largest tin exporter, banned all mineral ore exports as of the beginning of 2014. Later there were some changes to the new regulations, and there appears to be some easing of the regulations. With respect to tin there had also been some changes to the required purity content. The intent of the Indonesian government was to exert greater control over the tin prices, which, by the way also trades on the London Metal Exchange, and increase the return Indonesia gets from its mineral deposits. Among the impacts of this is to exert upward pressure on the tin prices as companies which need tin for their products become concerned about the security of their tin supply. It also encourages tin consumers to consider other sources for their tin supplies to provide a secure pipeline of the raw material needed. These supply concerns were highlighted March 11 when the Indonesian Navy seized 2,800 tonnes of tin from a ship that left Indonesia en route to Singapore. The reason provided was that the tin shipments were suspected to not be in accordance with the trade ministry regulations. The world seems to be becoming more complex annually, and that certainly applies to the tin industry.